2019 DE/DT Jackson Farsalas doesn’t have many schools showing interest at the moment, but is a name to watch out for moving forward. We talked his offseason training, where he will be camping this summer and his under the radar teammates. JF: This offseason I have been working on my lateral quickness as well as my footwork. Last season I saw a weakness in my lateral quickness so I’m looking to hopefully create that weakness into a strength and also hopefully being able to make myself a more versatile defensive linemen. JF: I believe I can bring a great run stopping ability to any team that would have me. I think my run stopping is very strong especially when I’m trapped. My size, strength, and speed allows me to effectively trap the trapper and cause disruption in the backfield thus creating a sense of chaos for the quarterback and running back. JF: Sadly none so far, but I’m looking to change that and improve myself this year. Now having said that I have received letters from some coaches saying they hope to see me at some of their camps. JF: I have gone on some regular college visits with my family but no football ones. I am looking forward to some of the camps I have signed up for. Those include the Northwestern camp this June and the Elmhurst college camp also this June. There are some more I’m looking to sign up for and hopefully prove myself to the coaches in attendance. JF: I try to lead by example, but not everyone is perfect so I make sure that when I do make a mistake others do not make the same one. Overall, this isn’t just a football team it’s a family and I am always there for my guys and they are always there for me. 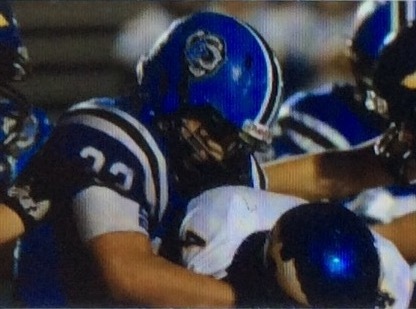 Yianni Manousaridas (Senior, 5’8″ 240) – Yianni is the rock of out offensive line and started last year for us. He is a amazing pass blocker and even better run blocker. If Yianni gets a hold of you and starts moving his feet you are now effectively useless for the rest of the play. He never gives up and never gives in to an opponent. Don’t let his size fool you he is unbelievably strong and can crush a defensive linemen twice his size. Yianni is unbelievably strong as well, for only being 240 pounds he has a 385 pound bench and a 585 pound squat. When Yianni has his eyes set on a goal nothing will stop him from achieving it. Marek Enters (Junior, 6’0″ 175) – Marek is a linebacker/wideout for our team this year, his first on varsity. Marek is very competitive and disciplined. His offseason workouts are crazy and launch him into greatness during the season. He has the ability to make amazing plays because of the speed and stamina he build during the offseason and can play every down if he’s needed to. He has a no quit attitude and is a very skilled route runner with great footwork. He is an even better teammate. I am excited to see what he can bring to the table for us this upcoming season. Austin Lepage (Junior 5’9″ 155) – Austin will be a defensive back for us this season. Austin is extremely competitive and is also a tremendous athlete. He plays three sports, basketball, baseball, and football. He is the prime example of the saying “it’s not about the size of the dog in the fight, it’s the size of fight in the dog” because even though he may be smaller that many wide outs he can play with the best of them just off his raw talent and competitiveness. I can’t wait to have him play for us this season, he will add an extra layer of competitiveness to our defensive unit. Ryan Vrenios (Junior 6’2″ 170) – Ryan is going to be playing wideout and linebacker for us this year. Ryan is unbelievably athletic and plays the ball aggressive in the air whether on offense or defense, and comes down with the ball almost every time. If he gets into the open field he will make you miss and turn on the jets and no one will catch him. He will be a very dangerous asset to either our defense or offense this upcoming season. Travis Katzenberger (Senior 6’1″ 200) – Even though Travis is a defensive linemen, he is probably one of the quickest and fastest kids on our team. Travis is also very discipline during the offseason thus giving him an extra edge during the season. Travis’ main strength is his pass rush abilities. He uses his quickness and speed to get around the corner and lay punishment on any unsuspecting quarterbacks. He has the ability to be the best pass rushing defensive linemen in our conference and will be a great threat that everyone of our opponents should what out for. I am very eager to line up with him on the defensive line and cause some havoc in the backfield this season.